Actress/Singer Ashlee Keating. Photo Credit: Gerry Garcia. While most kindergartners were keeping busy learning manners and how to read, Ashlee Keating, the bubbly brunette with a penchant for crowd pleasing, was already running lines for her Broadway performances and national tour. At six-years-old, she was starring alongside actor Richard Chamberlain in The Sound of Music. She played Gretl, the youngest member of the von Trapp family. Later, she would flex her TV muscles with guest roles on various soap operas and Nickelodeon hit shows, including the likes of iCarly and Victorious. And if that weren’t impressive enough for a rising starlet, in 2008 Radio Disney selected her as an up-and-coming artist, giving her the chance to have her music heard by some 20 million listeners and perform beside high-profile artists on tour. 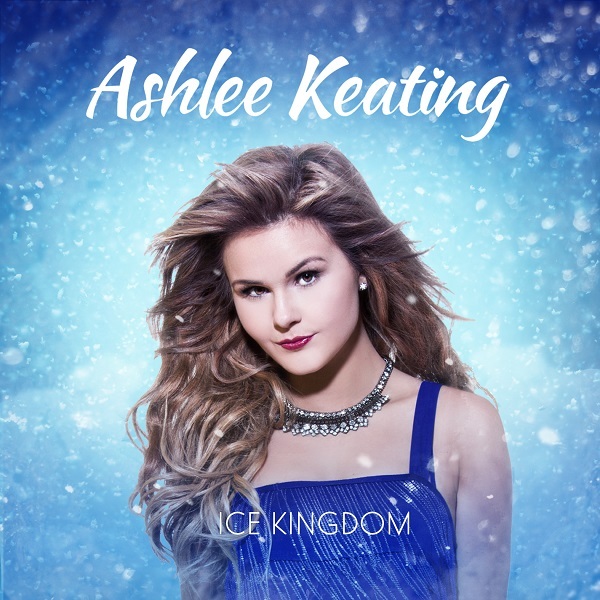 This year, Keating rids fans of the winter blues with her holiday anthem “Ice Kingdom” in anticipation of her first full-fledged album. The mid-tempo track is nothing short of exuberant and, according to the spirited singer-songwriter, it is reminiscent of her childhood winters in southern New Jersey, which usually features snow and plunging temperatures (this week’s controversial snowstorm “Juno” is proof enough!). Sparking feelings of warmth and nostalgia, the newly crowned Ice Queen croons that she feels “one step closer to home,” delivering an alternative to last year’s highly-addicting hit, “Let It Go,” from Disney’s Frozen. Keating, who proves that one can have two homes, has remained down to earth, despite performing her way into our hearts at an early age. And it is exactly this approachability and open-mindedness that differentiates her from those who have grown-up in the spotlight, making her an exemplary role model for the impressionable younger generation. Recently, the 21-year-old sat down with GALO, revealing her thoughts on her rise to fame and debut album, as well as playing Samantha Cole in Raymond Mamrak’s forthcoming film, The Mint. GALO: You have been singing since you were three, appearing on ABC-TV as a weekly artist. How would you describe your journey to stardom? Ashlee Keating: I’ve worked really hard. Music and acting are my life. I would just sing and dance around the house. I did a show called Al Albert’s TV Showcase on ABC in Philadelphia; I would sing a song every week on TV, and that is how I started my singing. Then I was on Broadway when I was five turning six. GALO: Last year you were featured as part of Coca-Cola’s 52 Songs of Happiness campaign with your song “Ice Kingdom,” which highlighted emerging artists from around the world. Can you tell me a little bit about what that experience was like for you? AK: It’s been an incredible experience. I loved being involved with a huge company like Coca-Cola. I visited the Queen Mary in Long Beach, California during the holiday season, and they turned it into a complete ice kingdom. It really inspired me when I went there; it was the most incredible thing ever. They had ice sculptures everywhere. Everything was ice. There were ice slides, snow, and skating. It really got you in the holiday spirit in the middle of California. It reminded me of home [New Jersey], just not as cold and snowy. I wrote one of my lyrics in the song about it being like home. Living in California, it’s very different. It’s always sunny. It only occasionally gets rain, and I love it. But I also like seeking snow for a small amount of time, so that helped me to make the holiday special. It made me happy. It was just incredible that they picked my song for that campaign — I’m very honored. Video courtesy of Ashlee Keating. GALO: I imagine there a specific process you had to go through to be selected for this campaign? Or did they approach you themselves? AK: It was really a tryout. I wrote the song [for them] and they liked it. GALO: In 2014, we had been inundated with mood boosting songs from many artists — most famous probably being Pharrell’s hit “Happy,” which even “Weird Al” Yankovic put a twist on. Seeing as the campaign was all about feeling joyful, I have to ask, what song currently makes you happy? AK: “Ice Kingdom” definitely makes me happy. I’m really excited because it’s being played on Radio Disney. It played during the holidays, which was fitting — Christmas songs really get me into the holiday mood. GALO: On your Instagram, you frequently don gym attire. The Huffington Post talks about how important exercise is to the creative process. What role does fitness play in your ingenuity and contentment? AK: It’s everything to me. I try to work out as much as possible throughout the week. I’m really busy right now, but I try to find ways to stay fit. I’m a health freak, so it’s very important. I love living a healthy lifestyle. GALO: Your single “Helluva Ride” is really fun and up-tempo, definitely something to dance to. Based on this, what should we expect from your debut album? Will it focus more so on the vibe or the storytelling aspect of music?